Description Pad the top and/or bottom of traces using zeros, mirroring or simple extrapolation. 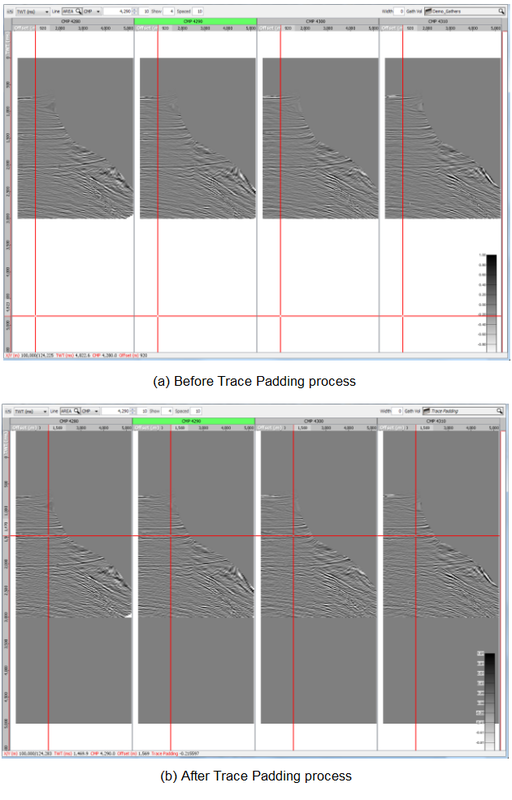 This process pads the top and/or bottom of traces in a TWT volume with zeros, simple extrapolation or mirrored samples. If ramping is selected, a linear ramp is applied across the padded values. 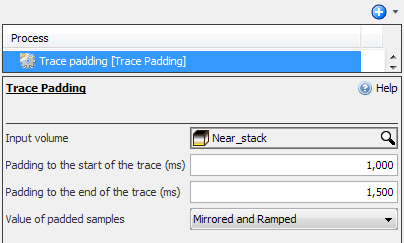 Select Trace Padding and type a name for the process. In the Details Panel, select the Volume to pad. Pad at the start/end of the trace (ms) — Positive values will add additional samples; negative values will trim samples. Pad times will be rounded to the nearest sample. Value of padded samples — Zeroes, mirrored, mirrored then ramped, or Pad start with first sample value and pad end with last sample value. In this example, we have added padding of zeros. It is possible to add mirrored and/or ramped padding instead.